Before we pray for anything, we need to pray first for the grace to be able to pray. Jesus says: “I am the vine, you are the branches. He who abides in me, and I in him, bears much fruit; for without me you can do nothing.” (John 15:5). When we offend God, we cannot even pray. The sky over our head becomes bronze, and the earth beneath us iron. (Deuteronomy 28:23). Our vitality is turned into the drought of summer. (Psalm 32:4). Therefore, we are desperately in need of God’s help even in order to pray to God. The psalmist confirms this. He tells God: “Quicken us, and we will call upon your name.” (Psalm 80:18). This means before we pray for anything, we need to pray first for the grace to be able to pray. Otherwise, our prayers become a waste of time. As a matter of fact, our prayers easily become offensive to God. This is what happened to Israel. As a result, the psalmist pleaded: “Lord God All-Powerful, how much longer will the prayers of your people make you angry?” (Psalm 80:4). For this reason, the disciples came to Jesus with a simple petition: “Lord, teach us to pray, as John also taught his disciples.” (Luke 11:1). They did not ask him to teach them how to pray. Prayer is simply talking to God. They asked him to teach them to pray. This is because, as with everything else, the grace to pray comes from God. Many do not know that the acceptable prayer is always according to the will of God. Therefore, Jesus answered the prayer of some disciples by saying: “You do not know what you ask.” (Matthew 20:22). Paul also observes that: “We do not know what we ought to pray for.” (Romans 8:26). Therefore, before we can pray, we need to ask the Alpha and Omega to give us the grace to pray and to direct our prayers aright. How does this relate to healing? When the disciples of Jesus could not cast out a dumb and deaf spirit, he rebuked them, saying: “O faithless generation, how long shall I be with you? How long shall I bear with you? Bring him to me.” (Mark 9:19). When they asked him later why they were unable to cast out the demon, he tells them that type of demon does not go except through prayer. However, prayer by itself does not heal. Certainly, the prayer of a faithless generation is ineffectual. What heals then? 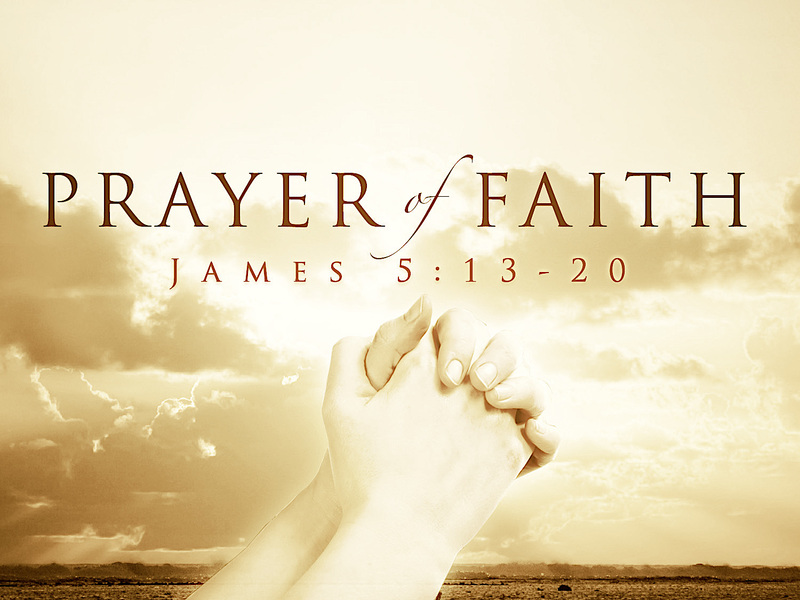 It is faith in God that heals: “The prayer of faith will save the sick.” (James 5:15). Jesus emphasised this again and again. When a woman with an issue of blood touched his garment, believing she would be healed by so doing, Jesus pointed out to her that her healing did not come from his garment. He said to her: “‘Daughter; your faith has made you well.’ And the woman was made well from that hour.” (Matthew 9:22). It is our faith that heals. As a matter of fact, if you have faith, you don’t have to pray for healing. You simply decree a healing and the healing is established. (Job 22:28). Jesus says: “Have faith in God. For assuredly, I say to you, whoever says to this mountain, ‘Be removed and be cast into the sea,’ and does not doubt in his heart, but believes that those things he says will be done, he will have whatever he says. Therefore I say to you, whatever things you ask when you pray, believe that you receive them, and you will have them.” (Mark 11:22-24). So, the critical issue is faith. How do we get it? Faith comes from God. “Faith comes by hearing, and hearing by the word of God.” (Romans 10:17). Jesus is the author of our faith. (Hebrews 12:2). When some Jews asked him: “What shall we do, that we may work the works of God?” he told them: “This is the work of God, that you believe in him whom he sent.” (John 6:28-29). But we cannot just decide to have faith and then get it. Faith is not of works. It is, first and foremost, a gift of God. “For by grace you have been saved through faith, and that not of yourselves; it is the gift of God.” (Ephesians 2:8). Therefore, we need to ask God for faith and pray earnestly for it: “Ask, and it will be given to you.” (Matthew 7:7). We must come boldly to the throne of grace, that we may obtain mercy and find grace to have faith in God. (Hebrews 4:16). When we do this, God gives us individually “a measure of faith” required to fulfill our petition. (Romans 12:3). If you want the faith to fight cancer, he will give you the faith to fight cancer. If you want the faith to fight a headache, he will give you the faith to fight a headache. The faith to fight a headache is not the faith to fight cancer. The faith to move a car is not the faith to move a mountain. So, let us go back to the earlier question we started with. Why could the disciples not cast out the dumb and deaf spirit? They could not because they did not have the faith to cast it out. They did not have the faith because they did not ask for the grace to have it. They did not pray for the faith. James explains this common predicament: “You do not have because you do not ask. You ask and do not receive, because you ask amiss.” (James 4:2-3). But he notes that to those who ask aright, God gives “more grace.” (James 4:6). How do we ask amiss? With regard to healing, we ask amiss because we ask for healing instead of asking for more grace and for more faith. If you have faith, you will be healed by decree. If you don’t have faith, you won’t be healed. According to your faith, so will it be unto you. For those who have been paying attention, Jesus emphasised this again and again. When two blind men asked him for healing, he asked if they had faith. When they answered in the affirmative, he opened their eyes by saying: “According to your faith let it be to you.” (Matthew 9:29). When blind Bartimaeus came to him for healing, he healed him by saying: “Your faith has made you well.” (Mark 10:52). Therefore, it is imperative for us to keep coming to the throne of grace to receive more grace and more faith to deal with the vagaries of life. When the disciples understood this, they said to Jesus: “Increase our faith.” He replied: “If you have faith as a mustard seed, you can say to this mulberry tree, ‘Be pulled up by the roots and be planted in the sea,’ and it would obey you.” (Luke 17:5-6).